What an incomparable Sunday afternoon, spent at Carnegie Hall reveling in the sound of seven glorious voices giving Händel his due--and then some. Only The English Concert, conducted by their Artistic Director, could have managed such a lucid and lively performance, holding our attention continually for over three hours. The plot of Rinaldo is based loosely on Torquato Tasso's epic poem Gerusalemme Liberata, the source of plots for many other operas. It is set during the First Crusades and the Christians are portrayed as the good guys and the Saracens as the bad guys. The happy ending involves the Saracens converting to Christianity. There are those who might find the story politically incorrect but we are not of that ilk. This was the first opera in Italian Händel wrote for the British stage in 1711, when the composer was only 26 years old. Much of its music was borrowed from operas Handel wrote in Italy and he revised it periodically to accommodate voices of different fachs. After an initial success, it lay dormant for two centuries. We are so glad it was resurrected, especially since Planet Opera is well populated these days with brilliant countertenors. Thankfully, the era of castrati is long gone! Goffredo and his brother Eustazio (a role often omitted) count on their greatest warrior Rinaldo to defeat the Saracens. Rinaldo is betrothed to Goffredo's daughter Almirena. The leader of the Saracens is Argante who is under the power of the sorceress Armida. Remember her from Handel's opera Armida? In this opera, she kidnaps Almirena and falls in love with Rinaldo whilst Argante falls in love with Almirena. It takes a Christian sorcerer to counteract Armida's sorcery. The plot is just an excuse for a compilation and recycling of some of Händel's most glorious music from his Italian period; listeners are sure to recognize much of it. From our point of view, we were must taken by Almirena's aria of grief and longing--"Lascia ch'io pianga" and its counterpart sung by Rinaldo --"Cara sposa". Other moments that grabbed our ear was "Augelletti, che cantate" due to the brilliant work of the recorder; the sopranino created some very realistic bird song. Tom Foster's harpsichord solo at the end of Act II dazzled us with its virtuosity as Armida planned her battle with the Christians. The three (and later four) trumpet players did a swell job of announcing battles. These trumpets had no keys and we were amazed by their tonality. As we come to discuss the singers, full disclosure requires that we repeat what we often say; when we have written about a singer for a few years we feel a heavier investment in their success and a greater pleasure in their achievements. We are not saying, however, that we are biased. Of course not! 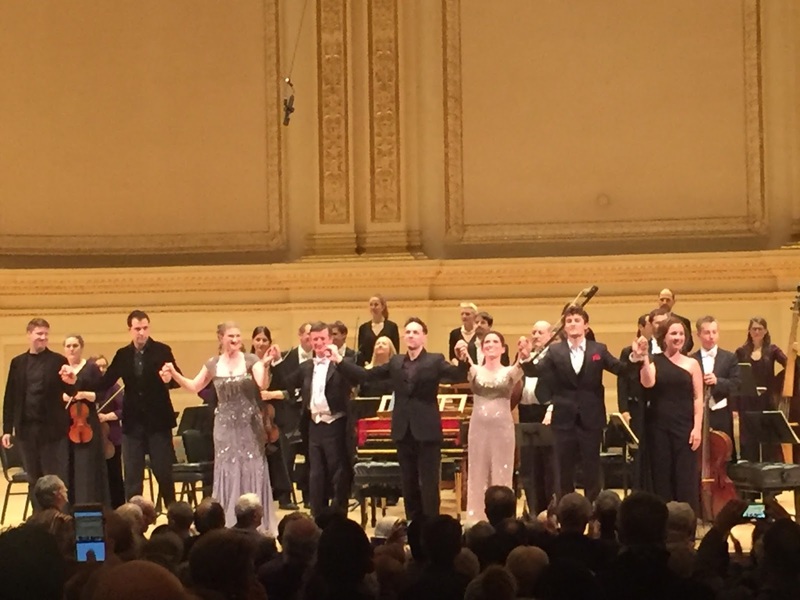 We first heard counter-tenor Jakub Józef Orlinski in a Polish church in Greenpoint when Il Giardino d'Amore presented Carnevale di Venezia as part of their tour. We went to hear our friend, soprano Amaya Arberas who, coincidentally, sang "Lascia ch'io pianga". We heard Mr. Orlinski and went bananas. What a thrill to find out that he was getting his Graduate Diploma from Juilliard, where we would go on to review his work at least a half a dozen times. We heard him in recital and in Baroque opera, and most memorably, singing "Duetto buffo di due gatti", which may or may not have been written by Rossini. Whoever wrote it, it was a performance we will never forget. We have heard him sing Polish songs in recital at the Kosciuszko Foundation, as well as Schubert lieder. We watched him break hearts in Jonathan Dove's Flight. He has never turned in a performance less than perfect and deserves every award he has won. In our opinion, he stole the show yesterday with his fine technique and expressiveness. There was strength down to the lowest end of the register. We are so glad that the part of Eustazio (Goffredo's brother) was not eliminated! We were very happy with all the singing but our focus on Mr. Orlinski has been explained. As Rinaldo, counter-tenor Iestyn Davis made a fine hero, one who was more lover than warrior. His timbre is appealing and our only quibble was a bit of weakness at the bottom of the register. Mezzo-soprano Sasha Cooke en travesti handled the role of Goffredo with fine style and vocal technique. The glamorous soprano Jane Archibald created a powerful Armida, especially in "Vo' far guerra". We enjoyed her love/hate duet with Argante in Act III. Argante was sung by bass-baritone Luca Pisaroni who always gives a great performance and managed to convey the ambivalence of his leadership and his importuning of Almirena--both successfully. Lovely soprano Joélle Harvey made a wonderfully complex Almirena. Just as Rinaldo's heroism is invaded by his romantic nature, her romantic nature is affected by her lust for winning battles. In a bit of luxury casting, the excellent counter-tenor James Hall took on several of the smaller roles. We'd like to hear more of him. Mr. Bicket conducted from the harpsichord with Mr. Foster at a second harpsichord. Outstanding work by the winds was laid over a warm carpet of strings. The presence of the grand theorbo is always exciting. a:What a terrific sound! Concert versions of operas are rarely this compelling. We can now consider ourself a fan of The English Concert and eagerly await their next visit.